Besides celebrating the latest drop of its Autumn/Winter 2018 collection, COS has another reason to pop the champagne. The second store, following its first at the Pavilion Elite Mall in 2016, is finally opening its doors to eager fans of the brand at The Gardens Mall on the 16th of August 2018. Kuala Lumpur joins a list of major fashion capitals as the brand’s choice to expand its ever-burgeoning name. We talk to COS Creative Director, Karin Gustafsson, ahead of the newest expansion in Kuala Lumpur. Congratulations on the opening of a second store in Malaysia! It’s been over a year since the first store opening here, what were some of the takeaways and observations that were taken from there and applied to the second store opening in The Gardens? Thank you! We were very excited to launch in the Pavilion Elite Mall in 2016. We have been really pleased with our reception in Malaysia so far and look forward to opening our newest space in The Gardens Mall. What are your hopes for the brand as it moves steadfastly towards a more global market, and further expansions around the Asian region? COS first launched in London, UK in 2007 and has since gone on to open stores across Europe, North America and Asia. We hope that our collections will continue to be well received in each location and that our customers will interpret the COS aesthetic in line with their personal style, wherever they may be in the world. How do you think the COS brand has grown to what it is today since joining almost 11 years ago? I joined COS as an Assistant Designer immediately after completing my Masters at the Royal College of Art in 2006. At this time the COS brand was still merely a concept yet to be fully shaped or realised. This was such an exciting time to join as the essence of the brand and overall aesthetic was being created. Since the launch 11 years ago, we have remained true to our philosophy; to offer high-quality fashion collections comprised of wardrobe staples as well as reinvented classics, in keeping with the brand ethos of modern, timeless, functional and tactile design. Your designs reflect your personal style; minimalistic without compromising timeless chic. How does this fit into the current millennial-driven trend of excessive, maximalist style and ugly fashion? At COS, we tend not to look to classic definitions of trends but instead allow ourselves to be influenced by all manner of different and sometimes unexpected factors. Everyone in the design team will collect images, books, swatches and all sorts of materials that they have gathered from visits to markets, exhibitions and trips around the world. Once we have collated a large amount of information, we pick ‘themes’ to develop which we feel are relevant and exciting for the following year. We feel that the essence of timelessness is great design and this quality lasts beyond seasonal trends. We prefer not to focus on what other brands are doing, trusting our own values, and believe our customers appreciate good quality that lasts beyond a season. 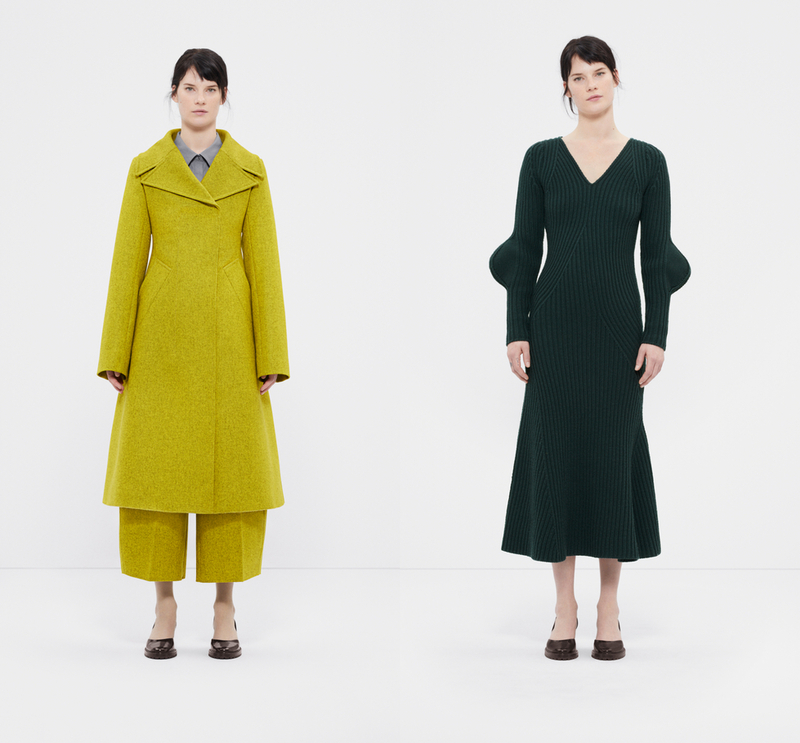 This collection is said to introduce new silhouettes from the brand’s previous collections, how is this Autumn/Winter’18 Collection different? For each new season we take inspiration from two pronounced themes. The AW18 collection is inspired by interdisciplinary research: real or imagined nature and processes which refine the raw. You will find a collection of classic wardrobe staples with altered proportions and innovative materials that celebrate hybrid, sculptural forms. We explored environments, both metropolitan and natural which acted as a starting point for the design process. 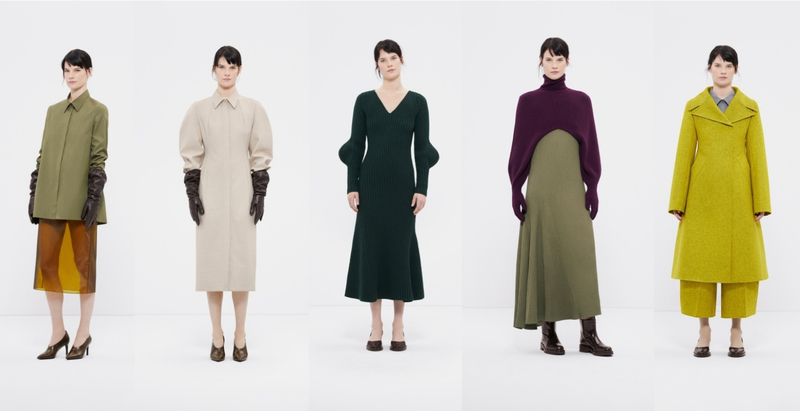 New silhouettes for womenswear include; a knitted dress in sea moss green which features organic ribs, exaggerating the ergonomic shape of the elbows and a felted wool pea coat in sulphur melange, paired with trousers and a technical shirt, offer a fresh take on proportions. COS is known for producing great quality clothing for prices that don’t break the bank. How do you find the right balance to accommodate both criteria? We strive to create quality pieces which have longevity and are accessible. The COS aesthetic is modern, timeless and often understated, focusing a lot on the cut and silhouette, as well as colour palette. Every season we reinvent wardrobe classics like the white shirt, cotton t-shirt etc, I believe this is something we are known for. We focus on quality fabrics and attention to detail in fit and function. All details are there for a reason, we never add a zip or a pocket if it offers no function and believe our customers appreciate the consistency and considered nature of this design process. The leap to e-commerce in 2011 saw the brand catapulting to greater heights, are there any plans for COS to operate an online store in Malaysia soon? Thank you. For now, we hope that our Malaysian customers enjoy the experience of shopping in-store. COS opens its second store in Kuala Lumpur on the 16th of August 2018. The store is located at F-223, 1st floor of The Gardens Mall, Mid Valley City. Preview the collection at www.cosstores.com. Olivier Rousteing will take the brand up a level next January. Stuart Vevers’s rugged and imaginative take on the New Romantics.